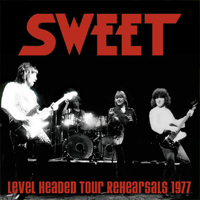 In 1977 SWEET signed a new recording deal and were about to tour UK and Europe to support the release of “Level Headed” album in 1978, which was to be the last album the band would record as the original four piece that had achieved so many Top 20 Hits (“Love Is like Oxygen” was their last Top 10 Hit in 1978 which ANDY SCOTT received a Ivor Novella Award nomination for co composing). This album is the actual recordings at Shepperton Studios, England where the band was rehearsing for the forthcoming tour to support the release of “Level Headed”. The master tapes for this release have been supplied by ANDY SCOTT from his archives. The sound quality is quite good, and Angel Air have included in the CD package a great booklet filled with photos & info on the band. As a sort of 'final document' of the classic line-up of the band, this one is a must have for fans. Sweet fans will delight to well-recorded live versions of cuts like "Action," "Fox On The Run," "Love Is Like Oxygen," "Sweet FA," and "Windy City." These are some of the last recordings made by the original line-up so they're definitely a necessary slice of history for Sweet fans. ...this is a worthy addition to any Sweet fan's collection. Who knows what they might have gone onto after this if they had stuck together. When all said and done these tracks are culled from rehearsal sessions and it would be harsh to be overly critical. They perfectly capture a band wrestling with transition and show both the highs and lows of that process. It's a worthy release for collectors.